Hived a new swarm this morning. Charlie and I went to the monthly MVBA meeting last night and guess what we got? A swarm! Paul, a fellow member and all around superhero, had heard that we lost most of our new packages so, when he caught a swarm, he brought it for us! 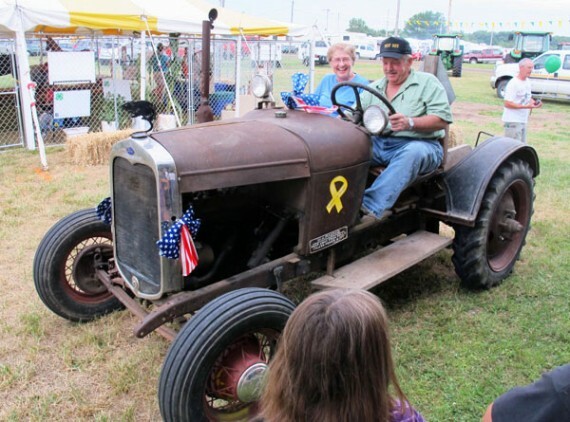 That is just about one of the nicest things anyone could do, don’t you think? Now I’m going to have to get pregnant again just so I can name a kid after him. Or maybe he’ll settle for a chicken or duck. We didn’t get home until late and so left the bees in the van (in their swarm box) overnight. 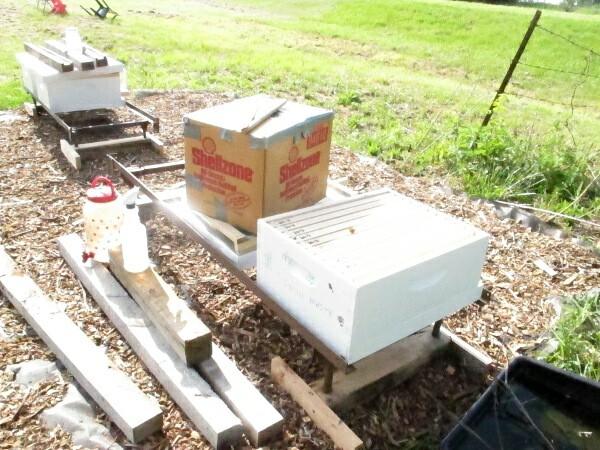 This morning, I set up the Snow White hive box on that pitifully empty hive stand. I brought out my camera and took a quick pic, then handed the camera off to Charlie. Apparently, my clumsy gloved hands must have hit a button or two because all of the photos came out horribly. I was able to edit a few of them enough to show you but they’ve all got that goofy over-edited look to them. I’ll get some better pics of Paul’s swarm box after the straggler bees clear out but this will give you a general idea. 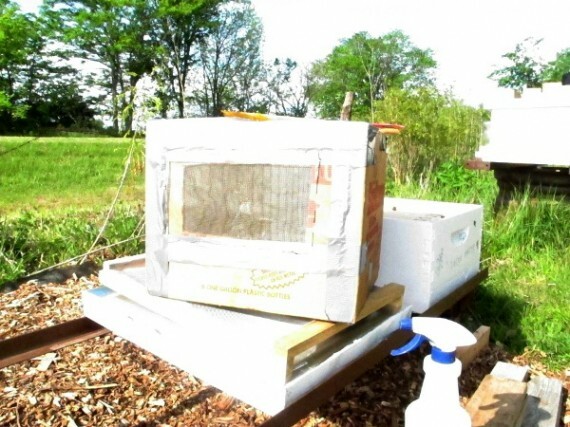 It’s a cardboard box with a screen “window” for ventilation. The inside has a bit of wooden framing to keep the lid from collapsing during/after taping it up. And, boy, does Paul love duct tape. A man after my own heart. It took me a while to fight the tape with my gloved hands. A brighter person would have just admitted defeat and taken off their gloves. But I’ve never been accused of being overly bright, now have I? When I opened the box, there was a big ol’ gob hanging from one of the top flaps and building comb. Maybe I should have knocked that clump of bees directly into the hive but with four top flaps flying around, I figured my graceful self would end up dumping them all over the ground and, with my luck, the queen would be lost. 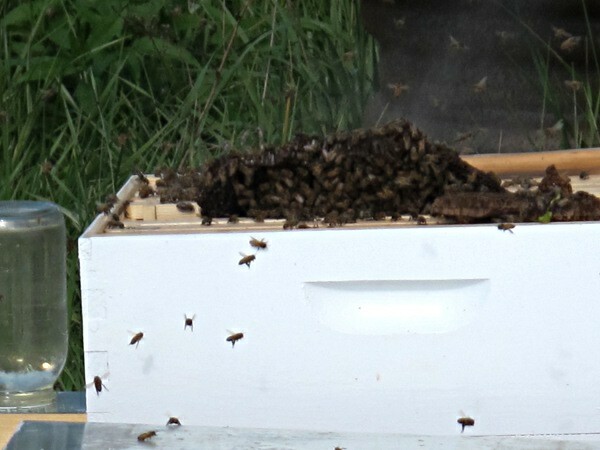 So I brushed the big clump back into the box, sprayed them with a bit of sugar syrup, and dumped them into their new hive box. Out with the bees — and there were a lot of them — came several chunks of old comb Paul had put in the box. I rubber banded them into a few frames and got everything & everyone settled in. While I was out there, I filled the boardman feeders on all the hives and stuck one on the new swarm as well. The bees are really sucking down the syrup this year but I guess it’s understandable. I don’t see much of anything blooming right now. We had fruit trees and other things blooming a few weeks ago but there’s nothing now. Cross your fingers for this new hive, will ya? I have been kinda busy. But here are a couple questions. Did you keep the queens caged (from your packaged bees) for a couple days, so the bees would start working the comb, before letting her out? Did you feed them, when you placed them in the hive body? Sometimes they simply won’t stay. But I’ve found these things to help. 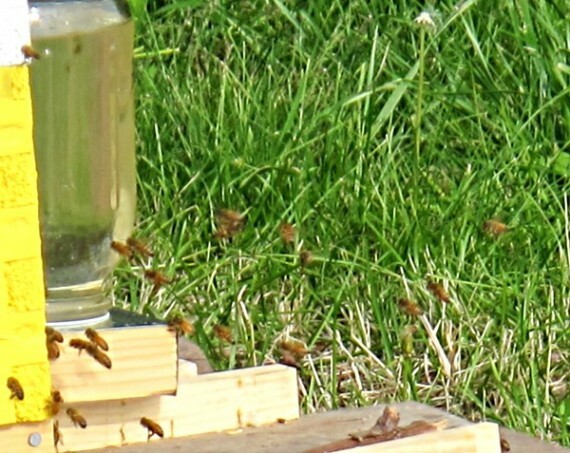 Also, if you can swipe a frame with fresh brood and put it into the hive when you introduce a swarm or package of bees, that will REALLY make them inclined to stay put. Bees are like broody hens, they HATE to abandon babies. Hiya, George. Yep, we kept the queens caged for a couple of days before releasing them and, yes, we put sugar syrup on all of the hives. 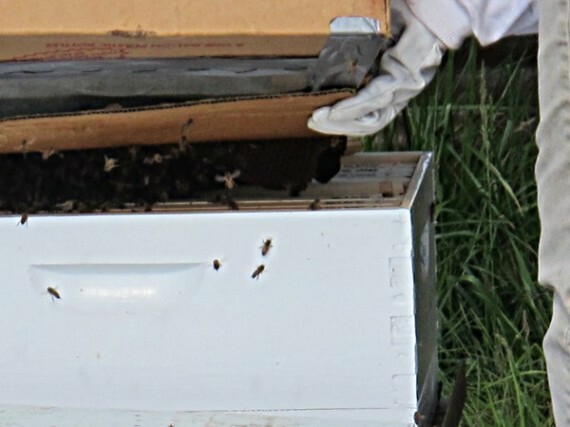 The packages stayed in the hives for over a week before they took off. I’ll keep that in mind for next time — putting a frame of brood into new hives. The only established hives we had were in deeps and these new ones were going into mediums so that wasn’t going to happen without some fancy footwork. We’re working on switching everything over to mediums from here on out so that everything will be interchangeable. Thanks! I appreciate any advice I can get!